Life with a 6-month-old is hectic. Where does the time go?! Between diaper changes, 3 a.m. feedings, laundry (and more laundry), tracking the milestones, daycare pickup and dropoff, doggie daycare pickup and dropoff, and two parents working full-time, it feels like an accomplishment just to make it through each week alive, but we're adapting to our new routine and celebrating Baby Ady's achievements! Now that she is six months old we have started introducing solid food. We're allowing her to take the lead by showing interest in food and bringing it to her mouth. We tried some peas, a few cooked carrots, avocado, sweet potato, and a baked apple slice. She held everything in her mouth but it all eventually ended up on her bib (and in her lap). We'll keep trying! My commitment to knitting and crocheting waxes and wanes throughout the year, but I had some time during my maternity leave to work on a few projects. I finally finished my temperature blanket that I've been creating for over a year! 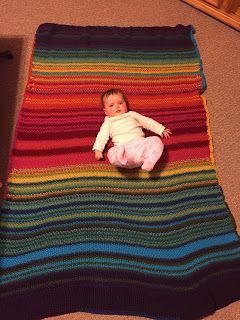 The concept of the temperature blanket is to knit a row each day based on the high temperature for the day, and the result is a random rainbow of colors representing the weather and seasons throughout the year. It was really special to me because I was pregnant for 9 months of the year in 2016, so it's also a testament to my pregnancy experience with little Ady. I like to look at the colors and remember where I was and what I did during the months of the year. I didn't exactly follow a pattern with the stitches, but I did a seed stitch pattern of alternating knits and purls, a simple pattern that lays flat when finished. I then created a basic crocheted border with double crochets.